Ferguson nametags: Department of Justice mandate not completely effective. A photo from Aug. 30 in which several officers appear not to be wearing nametags. 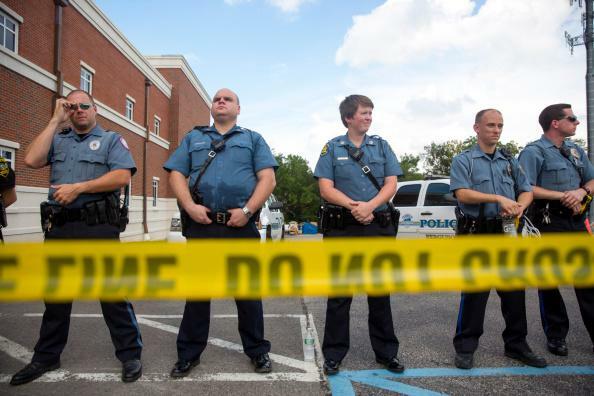 … the Justice Department said its investigators had observed Ferguson police officers not wearing, or obscuring, their name tags on their uniforms, a violation of the police department’s rules. It further was reported to us that some officers affirmatively displaying these bracelets had black tape over their name plates. The practice of not wearing, or obscuring, name plates violates your own department’s policies, which we advised you earlier this week when we requested that you end the practice imrnediately. A gaggle of journalists standing near the protest spotted a police officer who was not wearing a name tag. When a cameraman asked his name, the officer refused to give it and left the area. Maybe the third time will be the charm when it comes to the Justice Department reminding Ferguson to follow their own rules.